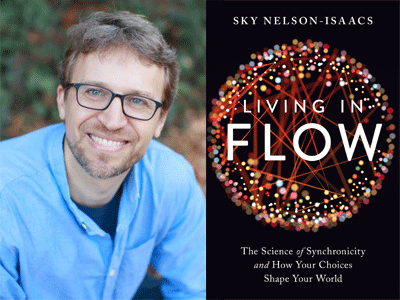 Theoretical physicist, speaker, author, and musician Sky Nelson-Isaacs discusses his astounding & accesible work, Living in Flow: The Science of Synchronicity and How Your Choices Shape Your World. When we align with circumstance, circumstance aligns with us. Using a cutting-edge scientific theory of synchronicity, Sky Nelson-Isaacs presents a model for living "in the flow"--a state of optimal functioning, creative thinking, and seemingly effortless productivity. Nelson-Isaacs explains how our choices create meaning, translating current and original ideas from theoretical physics and quantum mechanics into accessible, actionable steps that we can all take to live lives in better alignment with who we are and who we want to be. By turns encouraging and empowering, Living in Flow helps us develop an informed relationship to meaning-making and purposefulness in our lives. From this we can align ourselves more effectively within our personal, professional, and community relationships to live more in flow.